Aluminum patio doors are very common but some are better than others. There are also misconceptions about about them. Often people think that they are available in standard sizes and so parts can be changed between different makes of patio door. Not always. Some aluminum patio doors are made 79-1/4" tall while others are made 79-3/4" tall. Each door is slightly different. Each manufacturers door is slightly different than the next. This page will lay out some of the things to look for in a good aluminum patio door so you can make an informed buying decision. As well, we it will point out the parts that make up a sliding door and give you more information about those parts. 4 panel aluminum patio doors have 4 glass panels. 2 are fixed in place with screws or clips and 2 that can slide from side to side called "operators". The operators can be mounted on the left or the right. The screen door will usually slide in between the glass panels on a center track. This is good because it is protected from the elements. In a 4 panel door, there are separate sheets of glass in each of the 4 panels, usually 5mm thick. This glass is often required by local building codes to be tempered. This makes it safe if you accidentally walk into it and break it. Tempered glass will shatter into a million fragments which are not sharp. You might still have a headache, but you wont be cut by the glass. 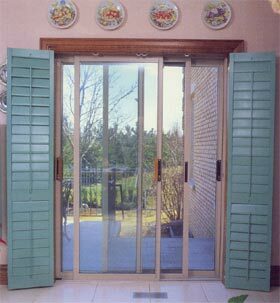 Typically, patio doors more than 20 years old will not have tempered glass. 2 panel aluminum doors have one fixed panel and 1 sliding panel. These doors usually have insulated glass units installed. Insulated glass is a sandwich of 2 or 3 panes of glass with a spacer in between. Modern insulated glass has an inert gas sealed inside which makes the glass a better insulator. 2 panel doors are often very heavy, so you need good rollers with a 2 panel door. Most patio door manufacturers make only the aluminum extrusions and cut those to size and install glass to make the panels they need. They make use of standard hardware such as locks, rollers and clips made by other companies who specialize in patio door hardware. In general, all of these parts are easy to replace on a 4 panel door, provided the right parts are available. Manufacturers use 3 different types of patio door latch. Two of them can be mortised or cut into the door panels and one is surface mounted onto the panels. All of them are easy for the homeowner to replace. Even modern doors use latches that have not really changed much since the 1960's. One very common latch is what I call the large mortise style This latch has the pull and the lock all recessed into a single hole in the sliding door panel. The whole handle is held together by two screws. Another common latch is the small mortise style. With these, just the lock mechanism is built into the door frame and there are seperate inside and outside handles. Usually everything is held together with two screws. The last latch is the surface mounted style. 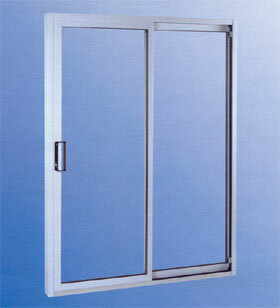 These are the simplest because is installed inside the sliding door frame. Just a handle on the inside and a handle on the inside, with the lock built into the handle. As before, there are just two screws holding everything together. There are also high security patio door locks, usually optional, that latch with two hooks. Again they are not hard to replace. Some of them have four screws to remove instead of just two. In addition to the latches are fix clips. These are plastic or metal clips the hold the fixed panels in place. They often get lost or broken on four panel doors. Very easy to fix and replace these. Do Aluminum patio doors keep out the cold ? 4 Panel aluminum entrances get their insulating properties from the air space in between the panels. So long as the panels have good pile weatherstripping around the perimeter and the frame is installed square and true, the panels will seal well and keep out the cold. Aluminum will conduct heat so a new 4 panel entrance will have a thermal break, or a plastic material in each of the 4 panels, to "break" the transmission of heat. The frame will also have a thermal break between the inside and the outside. 2 panel entrances have one fixed glass panel and one operating panel which slides. The screen is usually installed on the outside. 2 Panel entrances most often use insulated thermal glass. Thermal glass is 2 sheets of glass sandwiched between a spacer which does not conduct heat. New thermal units offer argon gas between the glass which slows the transmission of heat. A low E coating or film is also often included which also helps slow heat loss. As well , all modern entrance systems all use tempered glass for safety. The tempered glass thermal glass units are 5/8" thick so a thicker aluminum extruded frame has to be used in the 2 panel door. This frame has a thermal break, just like a 4 panel entrance system. The 2 panel entrance is more convenient because there are less panels to slide. Its also easier to keep clean because there are no panels to move and take apart. The drawback is the more expensive thermal glass. If the glass breaks it is expensive to replace. There are also problems with seal failure. If you have a thermal glass entrance which always looks cloudy, no matter how well you clean the glass, you probably have a seal failure with dirt getting in between the sealed panes. Seal failure often requires glass replacement. 2 panel entrances are very heavy because of the thermal glass. If you are looking at a door with panels wider than 40", make sure you choose a door that has "tandem" rollers to carry the extra weight. Tandem rollers have 2 bearings or wheels on the left and right sides of the door. 2 panel entrancs have a thermal break just like the 4 panel systems. The thermal break is often larger because of the thicker frame. 2 panel entrances also use multiple layers of pile weatherstripping to get a really good seal. A 2 panel entrance only has 1 panel between you and the cold weather, you need a really good seal. You may have a 3 panel aluminum entrance in your home. These systems were used by some builders. In a 3 panel door, there is one fixed panel with thermal glass and two sliding glass panels with regular single pane glass. One on the outside, one on the inside. The screen door is mounted on a track on the outside. These entrances get around the problems of a heavy sliding door by using 2 lighter panels. The lighter panel each has their own separate weatherstripping so these systems seal out the drafts quite well. Patio doors are often blamed for being easy to break into. There are a few steps you can take to make your entrance so secure that the only way in is to break the glass down. Most thieves do not want to go to that much trouble and make that much noise. Check with your entrance supplier to see if a commercial quality lock is available for your new door. Most patio doors use die cast metal locks and keepers that can easily be forced open with a long screwdriver or crowbar. A proper steel lock anchored with a steel keeper thats anchored in the door jamb with long screws wont be so easy to jimmy. If the manufacturer does not offer a better lock, get a patio door window bar to stop the sliding panel from being opened while you are away. Many manufacturers offer anti-lift blocks so the sliding panels cant be lifted out without first removing the blocks. These are dirt cheap security. Also make sure the fixed panels are installed with many screws holding them in place from the inside. Quite often new patio doors are installed with one plastic fix clip and screw holding the fixed panel closed. The fix clip is like a flag that says to the burglar, "Put Crowbar Here". I've even seen fix clips installed on the outside! Do not ask for trouble, put many screws directly into the frame along the height of the fixed panel on the inside.